Click Options > Font... to select fonts for the various parts of XMLBlueprint. • Name -- Select a font type from the available screen fonts installed on your system (shown in the list). 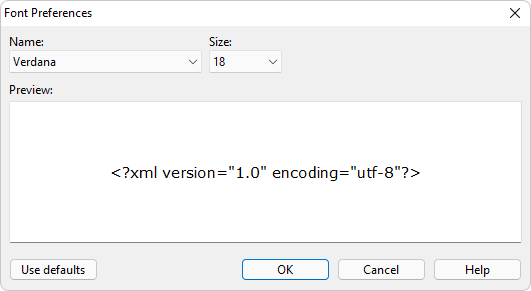 The XML Editor supports fixed-width fonts (such as Courier) and proportional fonts (such as Verdana). See the Preview text for an impression of the selected font. • Size -- Select a font size from the predefined font sizes associated with the font you selected in the Name list box. See the Preview text for an impression of the selected font. You can always restore the original XMLBlueprint defaults by pressing Use defaults .